We would like to introduce you to a new feature to our website. A collective effect by many to place their family information online to help those search for connections. We understand that family tree information online can be a challenge and sometimes not sourced. By doing this we maybe able to assist others by making suggestions or adding more information. 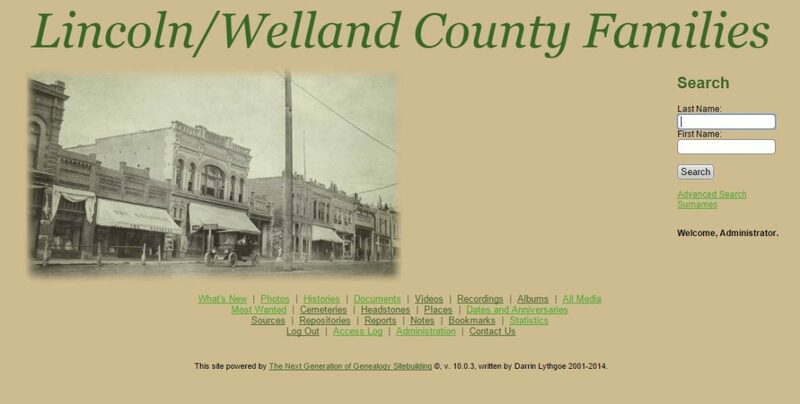 We hope by providing this opportunity we can build a picture of the families here in the old Lincoln/Welland Counties and help others connect to their past as well. 1. All persons wishing to access this resource must register, once your registration is approved you will have access to the database. This resource is free for members and non members of OGS Niagara Peninsula Branch. 2. Click here to send us your Gedcom file if you wish to be included – Add my info to the Site! 3. All Living Persons are blocked from viewing – If someone is found not blocked please let us or the owner of the Tree know so it can be fixed. 4. The Niagara Peninsula Branch OGS is providing this service for the benefit of the genealogical community – we have not verified any data and you need to verify it before you claim it as correct. 5. If you find any information that is offensive or should not be included please contact the branch here and we will review it. 6. You the owner of the Gedcom, will remain to be the owner of the information and will be granted such rights. By placing the Gedcom file with in the Lincoln/Welland Counties Families website you remain responsible for the data and the Niagara Peninsula Branch OGS is excluded from any damage your file may cause. 7. Finally, please enjoy this service and we hope that it helps you in your search. Click here to enter the site!